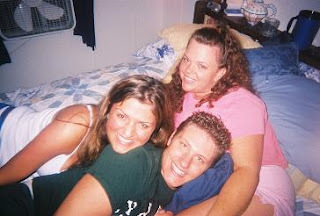 This PHOTOGRAPH was taken about five years ago... in my trailer... on my big sloshy waterbed... back when my a/c wasn't working and I had to keep fans in all the windows.... this is Kristin and Joey... my BFF's back in the day... they were young, wild, energetic kids who were taking the world by storm... and I was this crazy mother of three... and somehow we made this unlikely but very happy trio. I love this picture. I loved that time of my life. I loved feeling carefree and uninhibited and feeling the unconditional love that those "kids" brought me. BTW... I still have that SAME comforter on my bed... only instead of a water bed... it's an air mattress. Still a bit unconventional, maybe, but I think I'm a fairly unconventional person. Joey's moving to NYC... he's an actor... and Kristin, I think, does PR for a hotel. They're beautiful and successful and still wild and crazy and fun kids. But they're only 23 so they're allowed. Time passes so quickly and life wounds us and scars us and takes away our spontaneity. We face things when we're able to... and some people never find the ability. Again... my way is not the best way... but God is faithful... and He protects those who are broken, those who cry out to Him. And trust me... I cried out to God for many, many months. It was only when I had nothing left that I truly sought Him with all of my heart. And in that time He answered me. I say that because that's the reason I called the woman back. My story does not make me look anything but deranged and unstable and ... well, sad. But it makes God look amazing and powerful and omniscient (look it up, it's a cool word!) and loving. I didn't tell her everything... some of it she seemed to already know... I didn't add to what she knew... and I didn't confirm a lot of things she tried to pry from me. I just told her truthfully, with a joyful heart, that I am so happy to be here! I told her that God is good, because He is. I told her that I am loved and cherished and treasured in a way that no husband could ever love me or cherish me or treasure me. And I pray that what I had to say is repeated... and gossiped about... and that the story is... "and she lived happily ever after". Because I will. Taking another waaaaay back trip... a little background for my new readers... before Michael there was Barry... and Barry was an incredibly kind, sweet, hard-working, loving, Godly man. But Barry had responsibilities that prevented him from being in any kind of committed relationship with me. He cared enough about me to not sell me short. He would have been happy to stay in that kind of limbo forever... but he knew I would not be happy having half a relationship... and so he encouraged me to date other people. And that's when I met Michael. I'll never forget talking to Barry on the day of my first date with Michael. He said, "what are you doing tonight?" I said, "I have a date"... he said, "are we dating other people?" and I said, "I thought that's what you wanted me to do?" and he said, "I did, I just didn't know it would happen so soon". After 2 1/2 years. Apparently that's my shelf life. 2 1/2 years was so soon. For two and a half years we had talked about dating other people....He never did. I don't know if he has yet. Maybe he has. Barry and I became close while he was getting over Kimberly. They broke up in August of 2003 and we started spending time together that Thanksgiving. He was always so kind to me. We would pray together. We would share scripture together. I mean, obviously, that's not all we ever were to each other but there was a basis of a shared faith. I haven't told him yet what happened to me. In a way... I don't want to disappoint him. Two women that he cared for.... ending up in relationships that were so heartbreaking in very different ways. She seems so strong on tv... I hope she truly is happy. 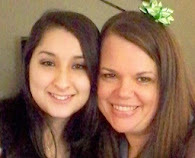 I haven't seen her since July 2006... (yes, we were always friends...) She has a baby now. Where was I going with this? I don't know... it's been a long day. I need to call Barry. Not that we are going to have any more of a relationship than we did then, especially since I'm now two hours north of him. But he was a good friend. I saw him on the day of Cody's graduation. 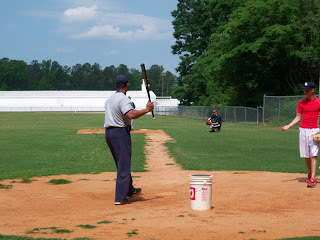 I went to Cody's baseball practice and Barry still coached him... after ten years or so... the first picture is of him. I remember well your Barry days! I recall, also, that while you were living in the cardboard castle, down to your last nickel, you had your boys, your life just seemed simpler. That doesn't mean without hardship, just simpler. Remember when you used to walk while Cody was practicing, listening to the Mom-pod? That is the Heather I see slowly emerging, only now she has deep scars, a pain that only she knows the depth of -- yet, a faith that will carry her through the darkness and into the light! I am so damn confused about the caller vs the OTHER WOMAN. I too remember your Barry days. I hope things go well when you call him. PRAY...look forward not back. And PRAY some more.